PHOENIX, April 30, 2018 – Recently released results from a University of Phoenix® College of Health Professions survey found that the role of nurses has grown dramatically in recent years. According to the survey, more than eight in 10 registered nurses (RNs) agree that healthcare professionals besides physicians (i.e. nurse practitioners, registered nurses, etc.) are playing (87 percent), or will play (82 percent), a larger role in the overall management of patient care. In honor of National Nurses Week (May 6-12), University of Phoenix sought to understand the evolving role of nurses and what this changing environment means for the future of healthcare. In addition to nurses playing a larger role in managing patient care, about a third (33 percent) of RNs say that they have seen an increased role in doing tasks traditionally done by a physician. This may be due in part to specialty tracks available to nurses, including nurse practitioner programs. About a third of RNs (36 percent) say they will see an increased role in focusing on the emotional well-being of patients. 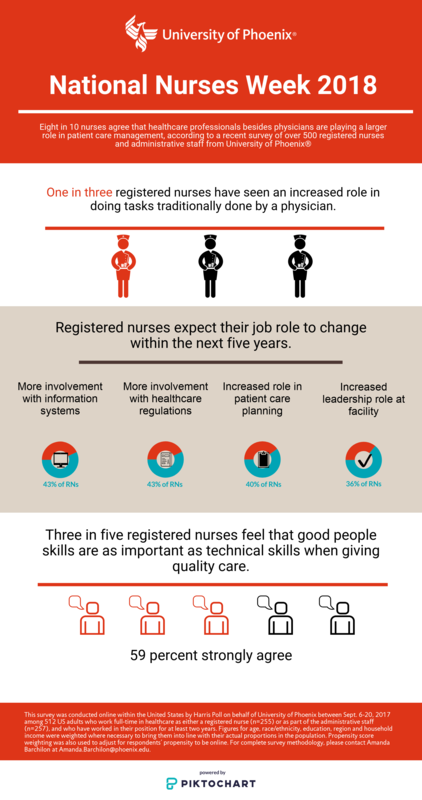 Additionally, nearly three in five (59 percent) RNs strongly agree that good people skills are just as important as technical skills when giving quality care. As opportunities continue to increase in the profession (the Bureau of Labor Statistics notes that employment of registered nurses is projected to grow 15 percent from 2016 to 2026), RNs note that their facilities should focus on preparing healthcare professionals with greater leadership skills (87 percent), according to the survey. To learn more about programs offered through the College of Health Professions, visit phoenix.edu. For full survey information and an infographic, click here. This survey was conducted online within the United States by The Harris Poll on behalf of University of Phoenix between Sept. 6-20, 2017 among 512 US adults who work full-time in healthcare as either a registered nurse (n=255) or as part of the administrative staff (n=257), and who have worked in their position for at least two years. Figures for age, race/ethnicity, education, region and household income were weighted where necessary to bring them into line with their actual proportions in the population. Propensity score weighting was also used to adjust for respondents’ propensity to be online. For complete survey methodology, please contact Amanda Barchilon. University of Phoenix® College of Health Professions offers leading-edge graduate, undergraduate, certificate, and non-degree programs aimed at preparing students to improve the quality of healthcare in their communities and the industry. The College of Health Professions is helping to ensure that today’s graduates can effectively tackle tomorrow’s healthcare challenges. For more information, visit phoenix.edu/chp.